Library image #2808: Cone Peak in distance. 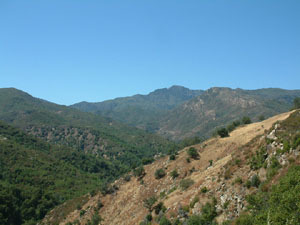 The United States Congress designated the Ventana Wilderness (map) in 1969 and it now has a total of 236,726 acres. All of this wilderness is located in California and is managed by the Bureau of Land Management and the Forest Service. Legend relates that the unique notch at the summit of Ventana Double Cone (4,853 feet) was once connected by a rock bridge forming a window, or ventana in Spanish. First established as a Primitive area before becoming Wilderness, Ventana straddles the Santa Lucia Mountains south of the Monterey Peninsula, an area of ruggedly beautiful coastal mountains. You'll find steep-sided, sharp-crested ridges and craggy peaks falling into V-shaped valleys wondrously hidden from the outside world. Elevations range from 600 feet where the Wild and Scenic Big Sur River leaves the Wilderness to 5,750 feet where the boundary circumvents Junipero Serra Peak in the eastern section (which is separated from the main section by non-Wilderness Arroyo Seco Indians Road). Most of the streams fall rapidly through narrow canyons over bedrock or exposed boulders, and waterfalls, deep pools, and thermal springs can be found along the major streams. A great diversity of vegetation is dominated by chaparral, the brushy cover that grows over much of Central and Southern California. Grassy meadows and stands of pine are located throughout the area, and virgin coastal redwood trees stand in the deep canyons of the fast-moving Big Sur and Little Sur Rivers. The largest population of mountain lions in America lives in the Santa Lucia Mountains; wild pigs, wild turkeys, and opossums may be found in abundance. Numerous other mammals and birds share the area, including the California condor. The area offers approximately 197 miles of trails from at least nine trailheads. The Pine Ridge Trail (24 miles) in the middle of the northern section is the most popular. Trails from Little Sur River in the north and Kirk Creek in the south attract many backpackers, and the trail from Kirk Creek up to Vicente Flat offers a challenging five-mile ascent to higher country with extensive views. Planning to Visit the Ventana Wilderness? How to follow the seven standard Leave No Trace principles differs in different parts of the country (desert vs. Rocky Mountains). Click on any of the principles listed below to learn more about how they apply in the Ventana Wilderness.